This distinguished, 15-story apartment house clad in limestone and pale beige brick above a four-story, rusticated limestone base has very attractive ornamentation and is one of the better looking major buildings on the avenue. Its sidestreet facade is particularly handsome and well designed with a very impressive entrance and sidewalk landscaping. 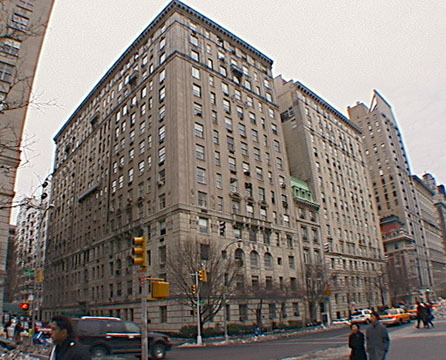 The building has 56 large apartments and was completed in 1926. It was designed by John B. Peterkin, who was best known for his very fine Art Deco-style Airlines Terminal Building of 1940 on the southwest corner of Park Avenue and 42nd Street that was subsequently replaced by the headquarters building of Philip Morris. This building, which has three arched windows on the third floor facing the avenue, has a prime and relatively quiet location along the avenue's "Museum Mile" across from the Metropolitan Museum of Art. Surprisingly, the building's rooftop watertank is not enclosed. 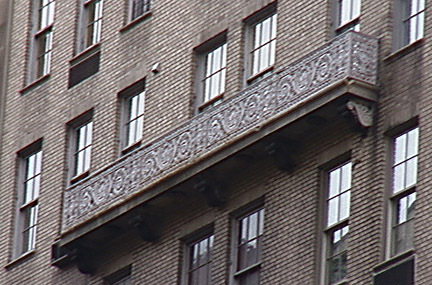 The building has a large and very impressive balcony on the sidestreet, shown above. Handsome lanterns flank the building's one-step-up entrance as shown in the above photograph. 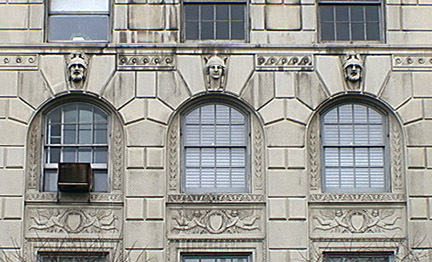 Designed in an Italian-Renaissance-palazzo style, the building has a nice cornice. It has a very impressive, canopied sidestreet entrance and lobby, a concierge, a doorman, and great views, but no garage and no health club. It permits protruding air-conditioners and unfortunately some "discrete" air-conditioners were allowed that broke into a decorative bandcourse as shown in the above photograph. The lobby is one of the most impressive and elegant in the city.